When you are injured by intentional or negligent actions of another person, professional or company, you have the right to be compensated for the physical, emotional and economic harm you have suffered. The most important decision you make is hiring an attorney to protect that right for you and your family. For more than 20 years, personal injury victims throughout the Woodland Hills metropolitan area have put their trust in Rick Fine. We provide compassionate and professional service to our clients and work tirelessly to obtain the funds they deserve. Rick Fine, along with his hard-working staff, have satisfied all clients and they continue to utilize his services as well as refer family and friends. If you or a loved one has been seriously injured by another's misconduct, contact our office today and learn more about how we can help you. Call us at (818) 710-7188 or use our online form. We provide free consultations and flexible fee arrangements. FREE consultations and flexible fee arrangements! A person injured in a car crash as a result of another's negligence has the right to compensation for damage to his or her health, earning power, and the loss of well-being. If your auto accident injury occurred as the result of negligence or misconduct, a auto accident attorney may be able to achieve a settlement that will recover your medical and rehabilitation costs, both current and future. 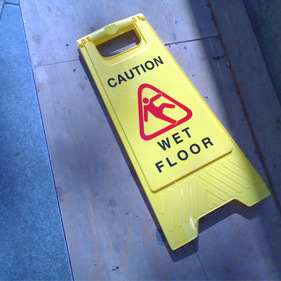 Walking surfaces that are not properly maintained and dangerous in any way, can result in devastating slip or trip injuries among others. Falling accidents remain one of the largest causes of personal injury, make sure you acquire proper legal representation so your properly compensated. 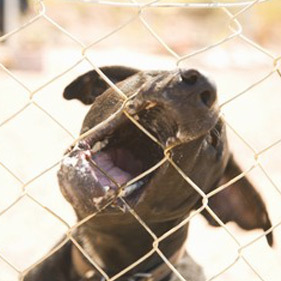 California is a statutory strict liability state and as such makes the owner of a dog strictly liable for any dog caused injury, whether toward another dog, person, or property, from the moment that ownership begins. From food poisoning to fall injuries due to unsafe conditions, personal harm while at sea is an all too common occurrence. While boating and cruise ship excurisions can be fun they are also filled with dangers and injury hazards. 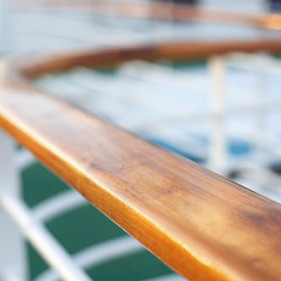 We can help you get the compensation you deserve from the large cruise ship companies. Daycares, schools and other child care providers are under legal obligation to provide your children with safe and suitable environments. Whether a child has suffered an injury, a choking incident or abuse, we can help protect the rights of your most precious and innocent young family members. Bicycles are rapidly becoming a popular form of cost saving transportation in Los Angeles but remain one of the greatest risks for injury sharing the road with automobiles. 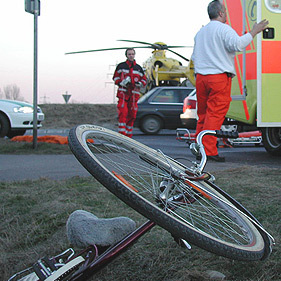 With three of four bicycle accidents resulting in fatal head injuries, it's imperative bicyclists know their legal rights when involved in an accident. When you are injured by the intentional or negligent actions of another person, professional or company, you have the right to be compensated for the physical, emotional and economic harm you have suffered. Medical attention and health is first and foremost. The most important decision you make will be hiring an attorney to protect that right for you and your family. If you or a loved one has been seriously injured by another's misconduct, contact our office today and learn more about how we can help you. Call us at (818) 710-7188 or use our online form below. We provide free consultations and flexible fee arrangements. At the Law Office Rick Fine, our staff know that it's hard enough for you and your family to deal with your injuries after an accident. For instance, you may be coping with a catastrophic injury, such as severe burns, head and brain trauma, spinal cord damage or a back injury. You may be unable to work and struggling to pay bills, including the astronomical costs of medical care. The last thing you need is dealing with an insurance company that will solely be out to protect its profits. That's where we can help. What type of compensation might be eligible for my damages? We are skilled and tough negotiators who will settle for nothing less than full compensation for your damages, such as: property damage, past and future medical expenses, past and future lost income, pain and suffering, and disfigurement. What type of financial arrangements need to be made? Rick Fine's usual arrangement for cases of automobile injury or wrongful death is a contingent fee agreement. The Law Offices of Rick Fine can advance expenses/costs on the client's behalf and it is deducted from the gross settlement along with the contingency fee. These expenses include but are not limited to: attorneys' and investigators' work, interviewing witnesses and others involved in the case, expert witnesses such as physicians, highway design experts, safety equipment experts and others, deposition fees, acquiring medical and other records, all of which can amount to substantial expenditures. Rick Fine agrees to be paid only if the client's case is ultimately successful, either by settlement out of court or by a judgment following a court proceeding. Rick Fine then receives a percentage of the final amount recovered. This fee arrangement is helpful for most people with a serious motor vehicle injury or wrongful death case because it does not require the person bringing the case to pay any money up front. When should I contact an attorney after being in an auto accident? If your auto accident injury occurred as the result of negligence or misconduct, a auto accident attorney may be able to achieve a settlement that will recover your medical and rehabilitation costs, both current and future. A settlement may also cover home modifications and future specialized care needs. If you decide to pursue legal action, you should contact an experienced auto accident attorney as soon as possible for review of your situation. There are deadlines called statutes of limitation, which regulate the filing of lawsuits. If you or a loved one have suffered injuries from a car accident and feel that negligence or misconduct was involved, you should not delay in contacting an attorney. If the statute of limitations expires, your right to pursue a claim may be forever barred. As attorneys, the information shared with the Law Offices of Rick Fine is legally protected by the attorney client privilege. As a result, all information will remain 100% completely confidential, even if you ultimately decide not to use our services. You can rest assured that with your information secure, it is in your best interest to provide all details related to your case so that we can best prepare and maximize your compensation. What if I am injured by an uninsured driver? While most states require vehicle owners to have automobile liability insurance, many drivers manage to get around the law. California is a "fault" car insurance state which means there are very few restrictions on the options of anyone injured in an accident, when it comes to pursuing an insurance claim or lawsuit against those who are legally at fault. You may require legal help in receiving the proper and complete compensation from your insurance companies when injured by an uninsured motorist. 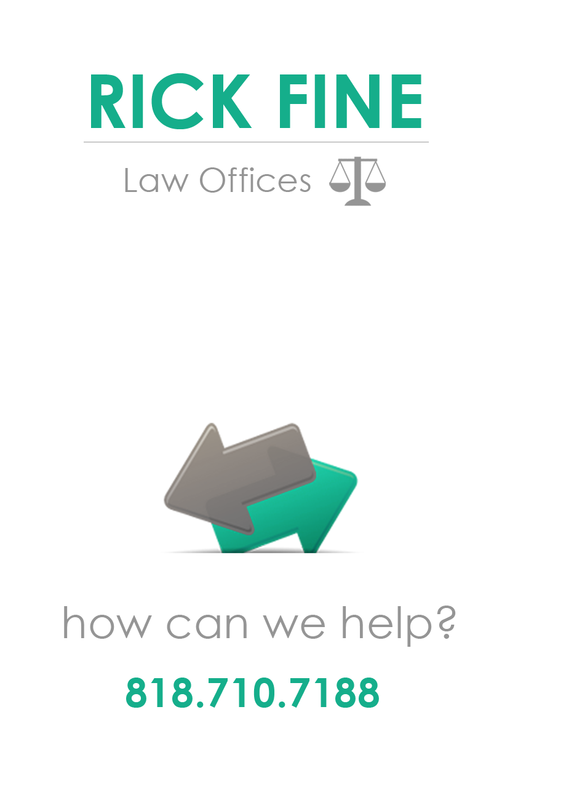 The Law Offices of Rick Fine are here to help. Contact us today using the form at the bottom of this page so we can gather more details about your accident. Why the Law Offices of Rick Fine? An important consideration in choosing your counsel in an automotive injury or personal injury case is to find an attorney with whom you feel comfortable, have confidence in, and someone whom you can trust. In the majority of cases there will likely come a time when you must decide whether to resolve your case through settlement or take it to trial. At that point, your confidence and trust in your attorney will be vitally important. We strongly recommend you interview at least two or three highly competent plaintiff's lawyers and law firms before making your final decision. Rick Fine would be honored to be among those that you interview and would be honored to be the firm you select. Our firm has helped recover millions in compensation for personal injury victims throughout the Woodland Hills and Los Angeles metropolitan area. We pride ourselves on providing the same compassionate and professional quality care to each and everyone of our clients clients and work tirelessly to obtain the funds they deserve. We've compiled a history of substantial verdicts and settlements, including many that are the largest in local and state history. A person injured in a car crash as a result of another's negligence has the right to compensation for damage to his or her health, earning power, and the loss of well-being. Compensation can include reimbursement for medical and hospital bills, rehabilitation costs, lost wages and future earning power, pain, and other physical distress, and psychological suffering as a consequence of injuries and losses. For more than 20 years, personal injury victims throughout the Woodland Hills metropolitan area have put their trust in Rick Fine. We provide compassionate and professional service to our clients and work tirelessly to obtain the funds they deserve. Rick Fine, along with his hard-working staff, have satisfied all clients and in turn they continue to utilize his services as well as refer family and friends to his office. Because insurance companies know that our office aggressively advocates our clients position and have trial attorneys at the ready to take a case to trial, we can generally resolve cases through a settlement. However, our team of trial attorneys have a successful record of obtaining favorable jury verdicts for our clients. While your personal injury claim is pending, we can also work with doctors, hospitals, healthcare insurance providers and collection agencies to make sure your medical bills are covered as we advance expenses/costs on the client's behalf and it is deducted from the gross settlement along with the contingency fee. 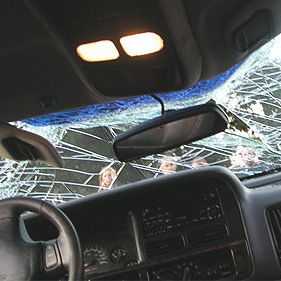 Most personal injury claims require legal action within two years after the date of the injury (or discovery of the injury), or else the right to compensation will be lost. That's why you should not delay in getting important legal assistance. Our law firm can be trusted with making sure that justice is sought in your case in a timely and diligent manner. To get started, contact Rick Fine - today for a free consultation by calling us at (818) 710-7188 or using our online form below! We know how to investigate and develop cases so that insurance companies will have the information they need to negotiate reasonably and honor a personal injury claim. This includes our work with highly qualified mechanical, engineering and medical experts at our disposal.